Our history spans almost 30 years, and we intend to continue writing new stories for years to come. In the late 1980's, it seemed that landfill costs were set to increase indefinitely under the pretence of lack of capacity. In February 1987, Mary Ellen Anderson, John Russell, and Frank Turner of Bosanquet Township instigated the initial background research for one of the first rural residential recycling programs in Ontario . The result was the formation of the Bosanquet Waste Management Committee in September whose primary objective was to assess current waste management practices and consider the feasibility of implementing a recycling program. A formal tender request was made for the provision of a blue box program, which yielded no response from the private sector. This disappointment resulted in only one viable option to receive this type of service, seeking municipal partners sharing similar needs. In July 1988, a committee, representing seven municipalities, found that small service areas made capital expenses prohibitive and recommended a multi-municipal venture to ensure success. John Russell, named Chairman, persisted to promote multi-municipal involvement by speaking to various groups. His efforts led to the formation of the Bluewater Recycling Association in February of 1989 with a total of nine municipal members. With the workload increasing it was deemed necessary to hire someone to implement the recommended program. Francis Veilleux, President, was hired in May 1989. When the recycling grant applications were sent the Association had grown to 22 member municipalities with 17 committed to start in September of 1989 representing 11,540 households. The growth of the Association reached over 80 municipalities from 8 counties at one point. Today, with all the municipal mergers the Association services over 20 municipalities representing nearly 150,000 people in over 63,000 households. The cleanliness of our air, land, and water and the preservation of natural resources are matters of impassioned debate for the Association. It was already operating within the strictures of Provincial and Federal regulations, but it went beyond these regulations to make our environment a cleaner one. Starting on November 6, 1989 , the collection of recyclables was changed to one side of the street, except for highways and major streets in all urban and rural municipalities. In 1990, the Association added programs into most schools. While the initial bluebox program was extensive for its time, collecting newspaper, steel and aluminium cans, aluminium foil, PET, HDPE, clear and coloured glass, and plastic bags, the Association was already expanding the program to accept telephone directories as well as fine paper and cardboard. Today, cardboard and fine papers are just standard items in the curb side bluebox along with boxboard, kraft paper, mixed resin tubs, aerosol containers, paint cans, and magazines. During the late 1990's special collections existed for textiles, hazardous wastes such as oil, paint, propane tanks, and batteries, tires, Christmas trees, and appliances. Today, only the Christmas tree chipping program remains. Service flexibility came with experience. The availability of biweekly recycling collection was made available in 1992 to those who would reduce or maintain their waste collection programs at the same or lower frequency as recycling since convenience was always a key factor for participation. Education was always a priority right from the beginning for the Association as our first annual newsletter was published in 1990. It was followed by a promotional video of the Association to help keep up with the demand for our public speakers and Material Recovery Facility (MRF) tours. Soon thereafter, in 1992 and 1993, an 800 page curriculum guide for elementary and secondary schools was developed for the local schools. These publications were followed by many more from the Association including our “cart smart” shopping guide, and Toxic Alternatives Recipes. Radio ads were used in the late 1990’s as was the implementation of an automated telephone information system and web site to reach our largest audience yet. Backyard composters were introduced to the membership in 1990 with a retailer network established by 1993. Sales grew steadily with the assistance of a mobile compost demonstration site and the implementation of garbage user pay programs. User pay was first introduced in 1992 by the Village of Grand Bend and followed by 60 other municipalities in our membership over the next eight years. It has proven itself to be the most effective tool to promote waste reduction. The householder now has a direct financial incentive to use alternatives such as the recycling and composting programs. These voluntary programs on their own resulted in a 15 to 40% reduction in waste. User pay made it a 65 to 80% reduction in waste exceeding the 50% reduction goals set by the Provincial and Federal governments years ahead of schedule. By 1994, the Association had grown so much that the Grand Bend 13,000 sq. ft. MRF once thought too large, was in fact too small to accommodate any future growth. An efficient search yielded a new 43,000 sq. ft. facility in Huron Park . Over the years, the Association has developed this unique technologically advanced processing facility that incorporates the latest technology such as an eddy current system, in line and overhead magnetic, a venturi based air classification system with a cyclone effect separation, air induced conveying systems, material perforation and fluffing systems, as well as a trommel screening based sortation. 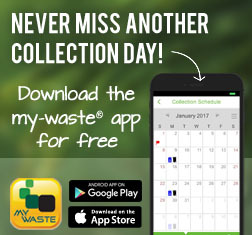 By 1995, the drastic reduction in waste generation combined with a collection time study resulted in the obvious need for a one vehicle collection system to ensure the long term viability of the programs in place. 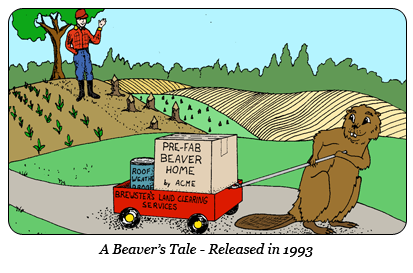 The Bluewater Recycling Association developed a new vehicle, which allows for the co-collection of three streams at the same time with variable compaction on the three streams. This allowed the Association to expand its recycling collection to now include waste. The three streams collected are: Waste, Fibres, and Containers. The co-collection program was officially launched in May of 1996 with a fleet of three vehicles servicing some seven communities. While the first year was one of learning and experimentation, it was nevertheless a successful first year. With minor adjustments the concept vehicle became standard equipment for everyday waste management. Second and third generation co-collection vehicles have since been designed. The third generation was added at the end of 2000. All of the Association's municipal depots were converted to the front end type of containers in 1999 to allow the recovery of materials such as cardboard from depots. The program's success was so great that the recovery doubled in a short time. Those municipal depots were redesigned in 2003 to better educate the residents and provide the containers with a fresh, clean, enviro look. 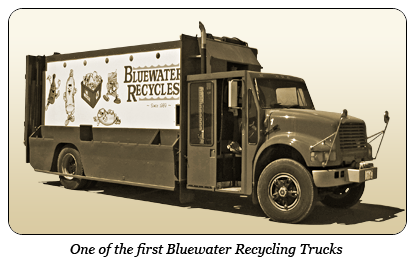 Through the collective efforts of local residents serviced by the Bluewater Recycling Association, there has been a significant reduction in the amount of waste destined for local landfills. These accomplishments were again recognized by the Recycling Council of Ontario (RCO), which presented the Association with its highest honours for the seventh straight year. 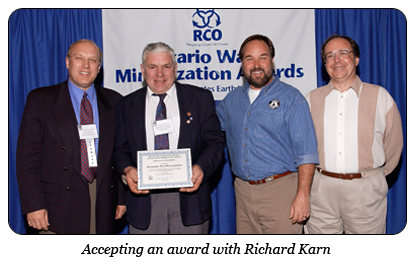 As a matter of fact the RCO had to establish the Platinum Award, in the category of Municipal Waste Reduction Achievement to recognize our exceptional efforts. This award recognizes those municipalities that have reduced their per capita disposal of residential solid waste by 90% over the provincial average and the Association has been the only recipient to date. The Association continues to keep abreast of external developments in its industry. The Association believes the time has come for a full review of our waste management practices, as many technologies are now available to better handle what we dispose of in an environmentally friendlier way while lowering costs. The results of our efforts will be the most effective waste management system in Ontario. Our system will divert waste like no other because it will continue to be built on the foundation that waste is simply an unexploited resource.